This fine and impressive antique diamond twist ring has been crafted in 14 ct yellow gold with a 14 ct white gold setting. 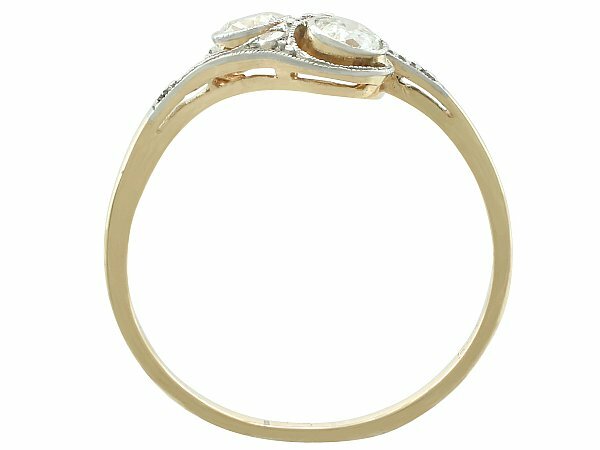 The pierced decorated, twist design ring mount is ornamented with two feature collet set Old European round cut diamonds set diagonally to the centre of the millegrain decorated arrangement. The mount is further embellished with two pavé set Dutch cut diamonds. The subtly tapering 14 ct white gold set ring shoulders integrate seamlessly in to the main twist design and join the plain 14 ct yellow gold shank at a subtle cuff design. This antique diamond ring is supplied with an independent diamond grading report card. This impressive 1920's diamond dress ring is fine quality set with very high colour graded old cut diamonds.